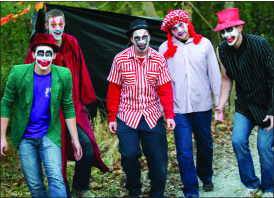 Scaremare, Liberty University’s student-run Halloween evangelism outreach, had 25,315 people walk the trails and rooms associated with the event this year, while 3,422 people said they made a salvation decision for Christ, according to Richard Brown, an assistant professor of youth ministries. Scaremare took place on the nights of Oct. 10-12, 17-19 and 24-26. According to Brown, Scaremare had a theme this year of Jesus being able to take on the cares of the world, which was represented by heavy backpacks. Visitors who entered Scaremare’s second house saw a skit performed by YouthQuest, a student-based ministry team that is an extension of Liberty’s Center for Youth Ministry. The skit incorporated backpacks, and students presenting the gospel at the end of Scaremare were told to highlight the same theme. Brown, who is in charge of the ministry part of Scaremare, including the gospel presentations, highlighted the fact that students who speak have been involved in several youth ministry classes at Liberty and have developed relationships with those who run Scaremare. The students who present the gospel have spent time gaining a favorable reputation before they are given the monumental task of presenting the gospel, Brown said. “While we understand scripturally that there is the spirit world, we don’t want to necessarily lean toward using the demonic side in order to do ministry,” Brown said. Scaremare uses death to show those who walk through Scaremare that they are faced with a future after death. “Jesus himself used some heavy preaching to get some reality checks,” Brown said. The staff who works to prepare Scaremare each year has expanded their vision for the future of the event. Brown said he wants to make Scaremare more frightening and put into place the ideas of those who wish to see Scaremare grow. “We would love to see more of our Liberty students (and) other students, getting involved to help, because we have big dreams and … we need more people to help,” Brown said. Brown said in order for Scaremare to be a success in the future, more involvement from Liberty students is needed. To learn more about how to get involved, contact the Center for Christian/ Community Service (CSER) office at liberty.edu/index.